Footage from a lovely family holiday to France, featuring a trip to Hardelot Castle, many walks, and a whole slew of sunsets. Featuring some snow, some sunshine, views in Scotland and England, and a lovely Easter trip to France. My final stop so far in 2018 is France, where I am currently enjoying the Easter holidays (thank goodness for scheduling posts ahead of time!). Here are seven books set in France which I have loved, and which, I feel, round off the week nicely. Which of these have you read, and which have taken your fancy? 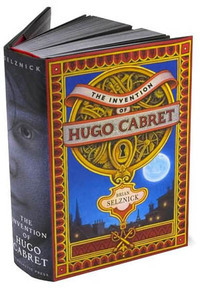 Brian Selznick calls his debut, The Invention of Hugo Cabret, “not exactly a novel, not quite a picture book, not really a graphic novel, or a flip book or a movie, but a combination of all these things”. It was the movie ‘Hugo’ which made me go and seek out this beautiful book – for a book it certainly is – and I purchased the very last copy in Waterstone’s whilst on a post-Christmas shopping trip. The book was the first novel to win the Caldecott Medal in 2008, the award usually applying only to picture books. The film also won five Academy Awards in 2012. I am so pleased that I have a copy of The Invention of Hugo Cabret to sit in pride of place upon my bookshelf. Just like the film, it is a thing of beauty – lavishly illustrated in black and white, with attention to detail present on every single page. 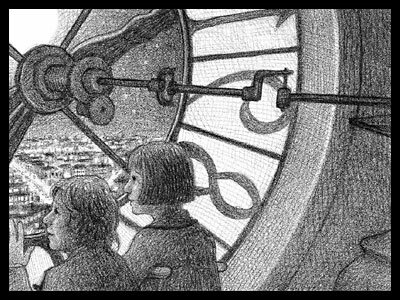 The style of the book is so very interesting: “With 284 pages of original drawings, and combining elements of picture book, graphic novel, and film, Brian Selznick breaks open the novel form to create an entirely new reading experience”. It is quite unlike anything which I have ever read before, and the mixture of narrative types and techniques works beautifully. The novel takes place in 1931, ‘beneath the roofs of Paris’. Selznick has woven in the true story of French filmmaker Georges Melies, and has created fictional elements alongside to build his very inventive plot. His sense of place is sublime, and I love the way in which the story was told, making use of its glorious Paris surroundings throughout. Hugo’s world is so well evoked. Hugo Cabret is one of my favourite child characters. He is so very determined and so headstrong, and he is also incredibly industrious. I love the way in which he looks after himself and is able to fend for himself in such a large city. I adore the levels of his curiosity, and the way in which he will work at something until it is fixed and he is satisfied with the result. The Invention of Hugo Cabret is exquisite, and it is truly a work of art. The entirety is enchanting, and its characterisation perfect. The pace which Selznick has stuck to works marvellously with the unfolding story, and the book and film are certain to charm both children and adults alike.